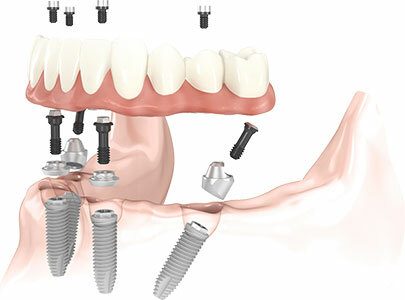 Your dentist will take the impression of your dental implants to fabricate a restoration replacing missing teeth. 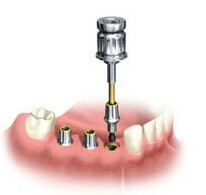 An implant crown is attached to the dental implant via an abutment, a small connector that is screwed inside the implant post. 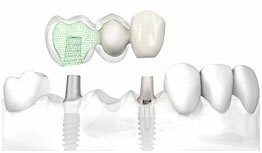 Once the abutment is screwed in and tightened, an implant crown or bridge will be either cemented or screw-tightened on top of the abutment. Implant crowns are similar to natural tooth crowns since they are individually attached to a supporting dental implant, allowing patients to easily floss between the teeth. This is a preferred option to replace single missing teeth. 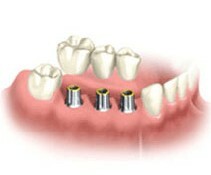 Implant-supported bridges may be utilized throughout the mouth when replacing several adjacent teeth. This option may be recommended for better esthetic outcome or to eliminate placement of additional implant fixture in anatomically deficient area. Implant-supported appliances can bring back normal function and a confident smile for people who are missing all of their teeth. An implant-supported bridge or a full-arch appliance often requires less implant fixtures for support than a number of teeth it is replacing. For instance, as little as four dental implants are required to support a fixed full-arch appliance.